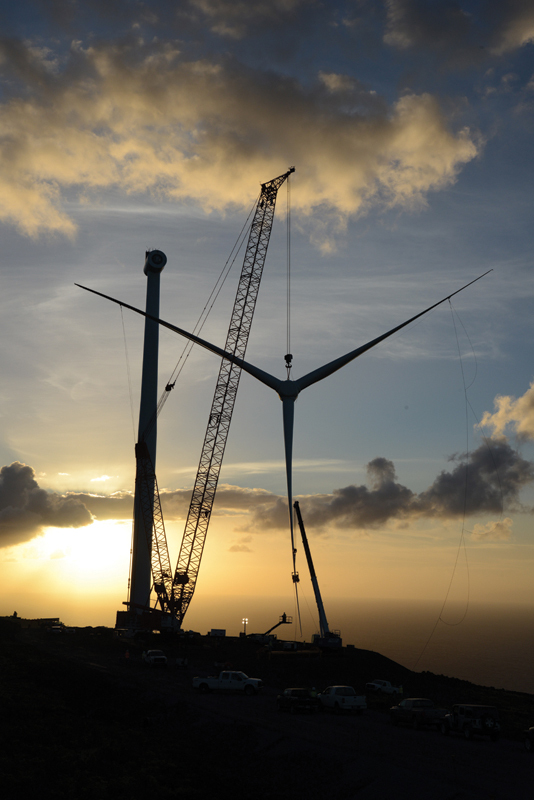 The Auwahi Wind project site in Hawaii possesses a tremendous wind resource, but building the project involved some tremendous logistics challenges since it is on a remote stretch of range land on the Ulupalakua Ranch on the island of Maui. 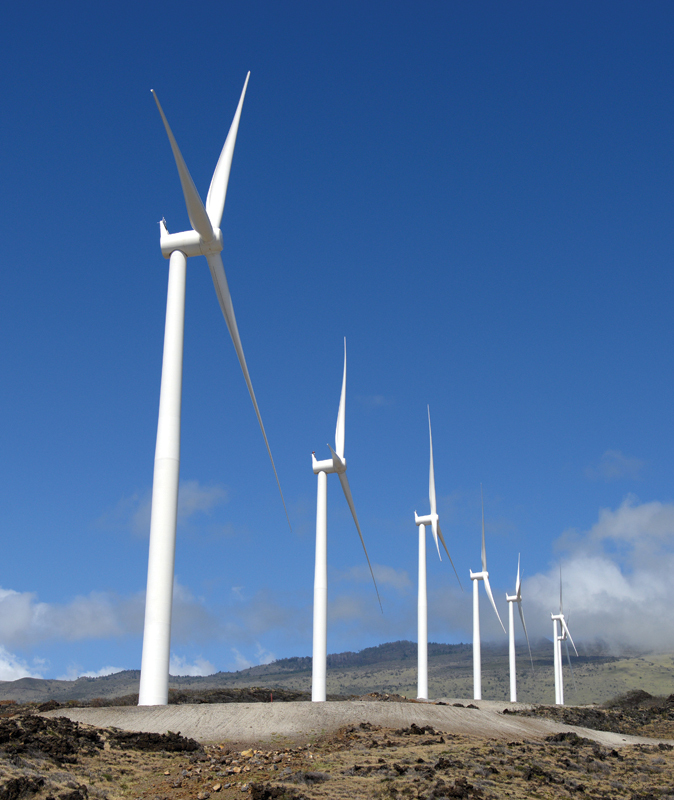 The Auwahi Wind site on Maui has one of the strongest wind resources Sempra U.S. Gas & Power has encountered. The channel between the Big Island and Maui creates a funnel that drives strong and consistent winds that are ideal for wind power. Perhaps more than any other U.S state, Hawaii has the most to gain from the development of renewable resources—primarily wind and solar power. Currently, most of the electrical power on the eight major Hawaiian Islands is produced using diesel fuel. No other U.S. state is as dependent on imported oil as Hawaii. For this reason, the state government has launched the Hawaii Clean Energy Initiative, with the goal of ramping up the use of renewable resources to supply 40 percent of Hawaii's energy needs by 2030 and reduce the state's dependence on imported oil. The initiative is certainly ambitious; it calls for achieving a further 30 percent in energy savings from efficiency measures. Part of the renewable energy solution for Maui, one of Hawaii's main islands, is the 21-MW Auwahi Wind project, located on the wind-rich Ulupalakua Ranch on the island's southeast coast. The project is a joint venture of Sempra U.S. Gas & Power and BP Wind Energy. The wind farm was completed in late 2012, and its eight Siemens turbines generate enough electricity to power approximately 10,000 typical Maui homes. An additional—and important—component of the project is an 11-megawatt grid battery system. Energy from the battery system helps regulate and sustain power to Maui Electric Company's grid during light wind conditions. Equity partners on Auwahi Wind, this is the fifth project Sempra U.S. Gas & Power has partnered on with BP Wind Energy. Sempra U.S. Gas & Power developed, constructed, and now operates the facility. The project has been in the works for some time. Sempra U.S. Gas & Power acquired the rights to Auwahi Wind from the wind energy operations arm of Shell in 2009 and actively began developing the project at that time. A power purchase agreement with Maui Electric Company was approved in 2010, which allowed the company to begin construction. The state of Hawaii in general and the Island of Maui in particular have outstanding renewable resources, says Scott Furgerson, senior director, operations west for Sempra U.S. Gas & Power. The Auwahi Wind site has one of the strongest wind resources the company has encountered. The channel between the Big Island and Maui creates a funnel that drives strong and consistent winds that are ideal for wind development. And Hawaii's clean energy initiative clearly shows the state is on board. "We've seen very real support and enthusiasm about renewable energy replacing fossil fuels," says Furgerson. As anyone who has ever visited Hawaii can attest, the islands possess spectacular beauty and rich wildlife—resulting in a natural heritage and lifestyle that is carefully guarded by its residents and government, which Sempra U.S. Gas & Power fully respects and works with. "Wind energy development is compatible and exists in harmony with the rural and agricultural character of remote development sites. We've found that to be the case both on Maui and with our wind projects on the mainland," said Furgerson. "The land can still be used for crops and/or grazing while the wind turbines produce energy—and provide a source of revenue for the land owners." The Auwahi Wind project is located on a remote stretch of range on the wind-rich Ulupalakua Ranch. A farm lease agreement between Sempra U.S. Gas & Power and the property owner means that the Ulupalakua Ranch can continue ranching operations and preserve the rural character of thousands of acres of open space for future generations. Sempra U.S. Gas & Power views Ulupalakua Ranch as a partner, says Furgerson. The company has successfully worked with the land owner to develop and manage Auwahi Wind in a manner that has had minimal impact on ranching activities. Furgerson reports that environmental sensitivities related to Auwahi Wind extended beyond protecting wildlife commonly affected by wind turbines, to include significant cultural considerations. The Auwahi project area contains a high density of archaeological features including several burial sites. As part of the environmental mitigation required by project permits, Sempra U.S. Gas & Power worked with the State Historic Preservation District, the Maui Burial Council, and local archaeological experts to redesign the project to avoid archaeological features. Archeological monitors were on site during all phases of construction. Before and during construction, in recognition of traditional Hawaiian cultural practices, Auwahi Wind also held several site blessing ceremonies led by respected Hawaiian spiritual leaders. During the very early stages of development, Sempra U.S. Gas & Power recognized the importance of seeking community input and moving forward in a manner that respected the native land and wildlife. The company reached out to the community to proactively address any concerns expressed on behalf of the landowner, neighbors, and local business owners and worked closely with project stakeholders and policy makers to move forward in a manner that minimized environmental impacts. Sempra U.S. Gas & Power was very proactive in communicating upcoming project developments each step of the way through community meetings, one-on-one discussions, website updates, a dedicated project hotline, and other media outreach. 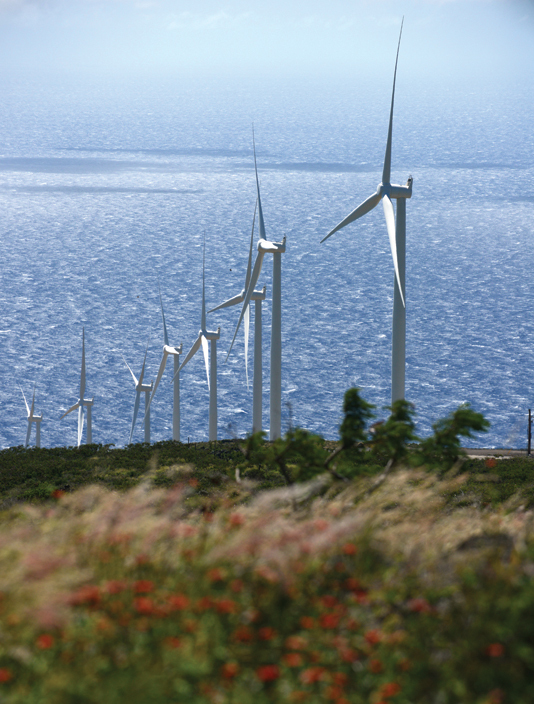 The Auwahi Wind project is located on a remote stretch of range on the wind-rich Ulupalakua Ranch. Sempra U.S. Gas & Power has successfully worked with the ranch owner to develop and manage Auwahi Wind in a manner that has had minimal impact on ranching activities. The development process for Auwahi Wind was more involved and lengthier than the average mainland wind project as the project required an Incidental Take Permit (federal) and Incidental Take License (state) for take of protected species. The permitting cycle was similar in length to a mainland project that needed a federal Incidental Take Permit. The difference is that most mainland projects can be sited to avoid these impacts, significantly shortening the permitting cycle. There was less siting flexibility in regard to Auwahi Wind. There were more agencies involved in the Auwahi Wind development cycle, but agency cooperation and guidance from knowledgeable consultants minimized delays, says Furgerson. There were a number of agencies to work with, which can add to the complexity of a project, he said. "However, the guidelines and requirements from each were clear and set out early in the process. The state of Hawaii and Maui County were very helpful in making sure the permit process was clear and the project moved along on schedule." As required by the Habitat Conservation Plan, a number of environmental measures have been implemented during and after construction to minimize the ecological and cultural impacts and protect federally-and state-listed species including birds and bats. The Auwahi Wind project originally involved 15 turbines, but this was revised to eight turbines, due to technological improvements. "Wind technology continues to evolve and improve," notes Furgerson. "When the project was first considered by Shell in 2009, fifteen 1.5-MW turbines were suggested. By the time Sempra U.S. Gas & Power acquired the project, the Siemens 3.0-MW turbines were available. This option allowed us to generate the same capacity using fewer and more efficient machines. The larger turbines were selected, bringing the count down from 15 to eight, minimizing environmental and cultural impacts." Due to its remote geographical location, all of the wind turbines, the grid battery system, switchyard, and electrical collection system equipment had to be imported to Maui and transported to the site. The logistics were very challenging, Furgerson says, with the on-island transportation being even more difficult to execute. Sempra U.S. Gas & Power had to construct nine miles of new roads through the pastoral back country of Papaka and through the lava fields at Auwahi in a manner that respected the environment. The new roads were designed and constructed to accommodate the transport of heavy and oversized wind turbine components (super loads). Much of the heavy construction equipment for the roadwork and turbine installation was imported, and the transportation itself also required specialized transportation equipment that had to be imported to Maui. The project required some easements for the road up from Makena to the Upper Piilani Highway, and Sempra U.S. Gas & Power worked with the appropriate organizations to obtain these easements. The port of Kahului was the only way to facilitate the delivery of major and permanent equipment, such as turbine components, to Maui. Sempra U.S. Gas & Power was also faced with an aggressive construction schedule that required completion by year-end 2013. With this in mind, the project had to establish a temporary, off-site laydown area east of the Kahului Port where the large turbine components were stored while the roads and turbine foundations were under construction at the project site. Setting up the off-site laydown area was a challenge in and of itself as the staging area needed to be large enough to fit all of the turbine components (i.e., blades, tower sections, nacelles, hubs, and containers) in an organized manner—and the components had to be transported to the site in sequential order. In order to minimize traffic impacts through the town of Wailea-Makena, transport of super loads could only take place during a specific three-hour window (during weekday evenings). The large turbine components were staged overnight along the easement access road and safely transported the following morning through 4.6 miles of the newly constructed transportation route. Over that route, the super loads were pushed and pulled up several steep slopes using semi-trailers and two prime movers. After traversing another four miles along the newly sculpted Upper Piilani Highway, the super loads arrived at the wind farm site. When the super loads arrived at the wind farm site, each component was transported to its respective turbine platform where the main erection crane was waiting to begin installation activities. The challenges that crews had to deal with when erecting the turbines included frequent high wind speeds, which are common at the wind farm location. Some of the turbines were erected with only minor delays, but others were delayed for more extended periods. "Using seasonal and hourly wind speed patterns, we found that the wind speeds were lower at night, which provided the best window for turbine erection," said Furgerson. "Installing the wind turbines at night required additional safety measures such as lighting plans that minimized stray light and environmental monitors to protect birds and bats that might be attracted to the bright lights." A123–grid battery system supplier; Tetra Tech–biological consultant; Pacific Legacy–archeological consultant; Water Resources International–water well driller and water supplier; and Goodfellow Brothers Inc.–community constructor, water contractor, general contractor subcontractor. As of February 2014, RMT was rebranded as IEA Renewable Energy. The renewable energy group at IEA also includes White Construction, Inc. Together the IEA family has built over 10,300 MW of wind power and more than 340 MW of solar power. Overall, construction went very well, says Furgerson, but Auwahi Wind was not without challenges. The completion of a 1,400-foot water well—required to support dust mitigation activities—was initially delayed, requiring the project to secure an alternative water source. There were also initial issues with the availability of road construction equipment and equipment breakdowns. Other challenges included successfully building nine miles of road in six months, requiring the construction of roadway at three separate locations with difficult geology, mountainous terrain, and dry conditions. The geology varies at the three major project locations. The substation was constructed at the end of a one-mile road on mainly soft, silty materials just below the grassland that serves as grazing pastures for Ulupalakua Ranch. The silty soil at this location required ongoing dust mitigation using water trucks prior to moving forward with construction activities. The wind farm itself was constructed on land that consists mainly of volcanic rock and silt. On the surface, the volcanic rock was porous and malleable but just below the surface, the rock became hard basalt, which required blasting. Along Papaka Road, there was a mixture of silt and rock throughout the 4.6-mile stretch. A significant amount of rock-crushing was required at all three locations which, combined with a significant amount of silt and dry weather conditions, required ongoing dust mitigation measures. Fortunately, all three sites had access to local water wells to support dust control efforts. In addition to the transportation and wind turbine erection challenges, the commissioning and integration of the grid battery system presented a number of added logistical challenges for the project management team, but they were successfully navigated and overcome. This is the first Sempra U.S. Gas & Power project to include a battery component. The grid battery system was requested by Maui Electric Company in order to help regulate and sustain power to the power grid during variable wind conditions. "The battery serves as a 'shock absorber' by storing energy and then releasing it when the wind dies down, maintaining a steady flow of power to the grid," says Furgerson. "It has worked great so far." Furgerson said the support and cooperation of Ulupalakua Ranch owner Sumner Erdman was key to the overall success of the Auwahi Wind project. "The working relationship could not have been better," he says. "The Ranch and its cowboys were always available to lend a hand, share local expertise and facilitate introductions to members of the local community." The last several years have been active on the renewable energy front for Sempra U.S. Gas & Power. In 2012, in partnership with BP Wind Energy, it completed wind facilities in Hawaii, Kansas, and Pennsylvania, as well as a jointly-owned solar facility in Arizona. And in 2013, Sempra U.S. Gas & Power—in partnership with Consolidated Edison Development—completed the 92-MW first phase of the 150-MW Copper Mountain Solar 2 project in Boulder City, Nevada, and started construction on the 250-MW Copper Mountain Solar 3 project. Both Copper Mountain Solar projects are slated for completion in 2015. In 2014, Sempra U.S. Gas & Power is scheduled to start construction on another solar facility in California that could produce up to 300 MW upon completion. Additionally, construction is underway on a 75-MW wind facility in Nebraska, with completion expected in late 2014. And there may be more work in Hawaii for Sempra U.S. Gas & Power. Earlier this year, the Department of Hawaiian Home Lands (DHHL) issued a request for letters of intent to develop renewable energy facilities on DHHL lands, including the Kahikinui land that is directly adjacent to the Auwahi wind facility. Sempra U.S. Gas & Power responded to the request with a proposal to construct up to 120 MW of wind power on the Kahikinui land. To date, DHHL has not yet chosen a developer for that parcel.